A beautiful city with a seamy underbelly. A girl in danger. Weird magic. Beheadings. Junk food. Am I talking about the recently-released BioShock Infinite, or am I talking about the just-updated Dishonored? Could be either one. And so, it's time to make the comparison that lots of people have been thinking about—time to compare Irrational's quantum-science shootfest BioShock Infinite with Arkane's mystical steampunk sneakfest Dishonored. "Why Kirk," you may be typing, leaning into your keyboard with your entire upper body, "what a B.S. comparison this is! These two games are very different!" Ah, but they are... and they aren't. And that's what makes this particular comparison so interesting. 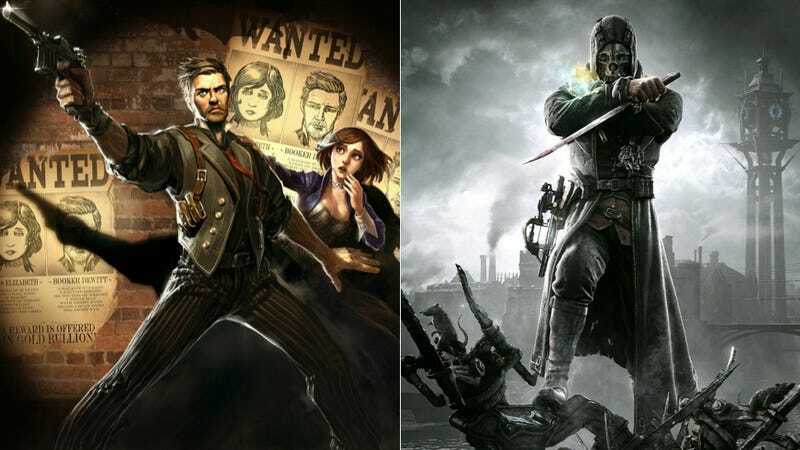 The two games have a good deal in common on a surface level—steampunk-influenced settings, stylized, Unreal-engine art direction, environmental storytelling, supernatural elements mixing with bloody violence, a damsel in distress whose name begins with "E"—but they also display fundamental differences the deeper you go. Major spoilers for both Dishonored and BioShock Infinite follow throughout. BioShock Infinite: The floating city of Columbia is a masterful synthesis of art design, architecture and writing. Its eye-watering bright colors and soft, melting sunrays belie the city's rotten core; jingoistic American sentiments and oppressive, racist dogma keep the haves and the have-nots separated in an often cruel way. The city is a floating contradiction, a collision of beautiful, false promises and the horrible truths beneath them. Dishonored: Dunwall is more straightforward; it's simply an ugly, grim place to be. While the surrounding islands may be in better shape, plague has ravaged Dunwall, and the rich live in cloistered communities while the poor die and turn into ghastly zombies. It's a city built on the whaling trade, and in many (near-literal) ways built on whales themselves. It's a dark, amoral city, and it's up to you to decide whether it deserves a chance at redemption, or whether only a crushing iron fist can cure its ills. EDGE: Toss-Up. And our first comparison is a toss-up! But really, this one's an impossible call. On the one hand, the Irrational art team (headed up by art director Nate Wells before his departure last year) have created something iconic and memorable in Columbia. It's an incredible city in more ways than one, and the kind of awful, beautiful place we rarely get to see in video games or anywhere else. Yet Dishonored art director Sebastien Mitton, visual design director Viktor Antonov and their team created something equally iconic with their game. Dunwall has the added benefit of actually feeling like a real, lived-in place. Columbia may get the edge in terms of sheer visual spectacle, but Dunwall feels rich and wretchedly real. It's a draw. BioShock Infinite: Elizabeth is a young woman with mysterious powers and a more mysterious backstory. She's brought to life by Courtnee Draper's performance, as well as by some fantastic work by Irrational's animators. She's a tragic Disney Princess trapped in a violent, cruel world. She has a thimble on one finger. Also, she can tear holes into parallel dimensions. Dishonored: Emily is little more than a plot device for most of Dishonored, but she's an effective one. (She's just so happy to see Corvo when you first arrive during the prelude!) Your decisions over the course of the game influence how she decides to rule once she's come of age, and she's played by Hit-Girl herself, Chloë Grace Moretz. EDGE: BioShock. I liked helping Emily as much as the next Dishonored player, but Elizabeth more or less WAS BioShock Infinite. I've seen the game described as a "second-person game," insofar as Elizabeth is so believable a character that even your own character Booker feels like a robot. Plus she's constantly throwing money at you. BioShock Infinite: The Lutece twins were one of BioShock's unexpected delights—an enigmatic man and woman with apparent supernatural powers and a curious sort of detached humor about the world. Is this all a game to them? An experiment? Or something more? EDGE: BioShock. The Luteces were a welcome bit of dry humor amid much of BioShock Infinite's self-seriousness and satirical caricature. They were prime drivers of the plot, architects of everything in the game, but in a way that felt considered and, eventually, explained. They had a natty sense of style, too. BioShock Infinite: Booker DeWitt may not be half as winning as Elizabeth, but that's kind of the point; as speaking first-person protagonists go, he's far less annoying than some, and his relationship with Elizabeth is another of Infinite's strong points. Furthermore, his history plays a vital role in the overarching narrative, from the beginning up to the surprising conclusion. Dishonored: Corvo Attano is a traditional silent first-person protagonist; he's little more than a dude in a scary mask who everyone likes to talk to. He's fearsome enough-looking on the cover and in the game's art, but we don't really get a sense of the dude beyond his hands and the blade they wield. EDGE: BioShock. No contest, really. Booker's somewhat of a bore and his hunger for junk food is ridiculous, but he's fleshed-out and integral in a way that Corvo never is. BioShock Infinite: The "magic" in BioShock Infinite isn't quite magic, it's science! Specifically the research of Rosalind Lutece, a genius in quantum mechanics who has come up with a way to bend reality and peer into alternate dimensions. Though actually… there is some magic in Infinite, given the fact that Booker is able to grab "vigors" to power up his left hand with the ability to magically shoot crows or electricity. Whether or not vigors were created after someone peered into Rapture is left somewhat ambiguous. Regardless, in Columbia, magic and science combine in a way that's muddled, but enjoyable. Dishonored: The magic in Dishonored is straight-up magic, with no attempt at scientific explanation. The Outsider turns up, and the next thing you know, Corvo can teleport himself across rooftops and possess rats. The whole Outsider storyline never really got developed or resolved, and the dude himself was kind of this annoying jerk. But, he gave you the ability to stop time. So. EDGE: Dishonored. When it comes down to it, the explanations for magic aren't half as important was what the magic actually lets you do. And on the whole, Dishonored's powers are just cooler than Infinite's. Most of Infinite's powers either came down to crowd control or damage dealing, while Dishonored's worked in concert, letting you stop time, possess a fish, blast out of the water and cyclone a couple of dudes off a bridge, then teleport into the shadows before anyone had time to react. 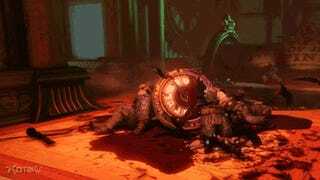 BioShock Infinite: BioShock Infinite relies on the same backstory device as past BioShock games: Collectable recordings. Not only do these strain credulity (the leader of the city just sort of leaves his personal musings lying around, huh? ), they're also a chore to hunt for, and it's easy to miss a lot of them and in so doing miss a lot of the game's backstory. Dishonored: Dishonored takes a different tack—you carry around a human heart that, over the course of the game, is revealed to belong to the deceased Empress Kaldwin. Use the heart while pointing at a character or place and you'll get some backstory, insight, or other bit of information. It's easy to forget to use the heart while playing, but if you do, it opens up and explains the world of Dunwall in marvelously dark, unexpected ways. EDGE: Dishonored. Audio diaries are so 2007, and Dishonored's heart is a clever and enjoyably macabre way to learn more backstory, should you want it. Furthermore, the vital bits of Dishonored's story don't require any collecting or heart-listening; they're right there in the dialogue and story, so it's impossible to miss vital information. And more to the point, a magical, whirring heart filled with gears and wires is just a lot cooler than a mini record-player. BioShock Infinite: The mechanical beasties in BioShock Infinite come in three varieties, more or less: There's the Songbird, a massive mechanical beast that you never actually get to fight. There's the Handyman, a big-handed bullet sponge who is alternately thrilling and incredibly frustrating to take on. And there are the Patriots, who are usually Robot George Washingtons with miniguns that march towards you, destroying everything in their path. Sometimes to fight them, you have Elizabeth conjure a Robot Abe Lincoln, though the bad guys never retaliate by conjuring a Robot John Wilkes Booth. Dishonored: Dishonored's bad guys only come in one mechanical variety: The now-iconic Tallboys, which are really just men on robotic stilts wearing heavy armor. In later levels, you'll have to be very careful to avoid the wide view of the many Tallboys you'll encounter; piss one off in the open and you're more or less done for. EDGE: BioShock. This one's close, but while the Tallboys may be a tad more interesting to square off against than the Patriots or Handymen, it's difficult to argue with a tank-like Robot George Washington, marching forward while spraying bullets and jingoistic propaganda. BioShock Infinite: As you fight your way through Columbia, you'll eat enough junk food to induce diabetic shock. Food gives Booker health, but only a tiiiiiny bit, meaning that he'll be sprinting through battle, wolfing down apples and cotton candy and popcorn and baked beans and like, whole pineapples like they're going out of style. Dishonored: Dunwall is a whaling city, meaning that almost all of the food is derived from the massive aquatic beasts, or from other sea life. Jellied Eels, Brined Hagfish and "Rat Skewer" are all pretty nasty, but there were those tasty-looking apricot tartlets lying around. EDGE: Dishonored. While I like carnival food as much as the next guy, I found that the food in Dishonored was so delightfully gross that I always enjoyed chowing down. Plus, I never found myself running around hoovering up food while under enemy fire. BioShock Infinite: In Infinite, you can blast a green ghost from your left hand and take over any robotic enemy or, once you've upgraded, any human. The robots will fight for your side for a time before turning their guns back on you, while enemies will fight one another and then kill themselves. It's a very useful (borderline overpowered, even) ability, and one of the few vigors that doesn't feel interchangeable. Dishonored: In Dishonored, you can truly possess enemies, zooming into the brain of a guard, Tallboy, rat or even a fish and controlling them for a time. You can use rats and fish to access areas behind locked doors, and escape crowded rooms by leaping into a guard's head. (And as a nice touch, after you've possessed a guard, he usually barfs everywhere.) It's one of the most distinctive and flexible of Dishonored's many tricks, and also one of the most enjoyable. And the creepy whispering sound it makes when you zoom into a rat is neat. EDGE: Dishonored. While the possession ability in Infinite is quite useful, it's a fraction as well-crafted and distinctive as Dishonored's. Many games have rats: Too few have rat-possession. BioShock Infinite: Crows. Crows that are invincible, and can be summoned out of thin air to attack your enemies. Dishonored: Rats. Rats that are pretty much just rats, though they are responsible for the plague that's ravaging Dunwall and they can strip the flesh from a man's bones in seconds. And you can possess them. EDGE: Toss-up. Do you like crows, or rats? Neither? Sorry. BioShock Infinite: There are a number of ways to get around Columbia, but the most prevalent one in the game is the skyhook. A combination zipline and rollercoaster, it's a breeze to use, fun in combat, and when present, gives some of the otherwise rote gun battles an open, rambunctious sense of freedom. You'll arrive in Columbia via rocket ship, which is enjoyable, and most people get around the city in blimp-like airships that are easy on the eyes and are oh-so pretty when they explode. EDGE: Toss-up. Infinite may have Dishonored beat on style points, but Dishonored's blink ability is possibly the single most empowering, enjoyable transport-tool in recent video game memory. It's a testament to how cool the Skyhook is (when it's working) that it can actually compete with Blink. A real toss-up, this one. 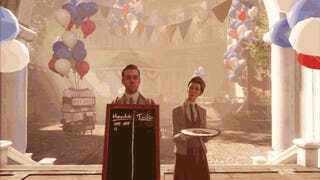 BioShock Infinite: There are choices in BioShock Infinite, but they're cosmetic. In fact, that may well be the point: No matter what you do, whether you try to throw the baseball or don't, whether you choose the cage or the bird, the ending will be the same. Perhaps in reaction to the negative criticisms of BioShock's commentary on video game choice or perhaps as a furtherance of it, you are telling one story in Infinite, and it'll be told the same way every time. Dishonored: Dishonored is a game about choice, not only in that you can choose to behave morally or immorally and in so doing affect the state of the city and the end of the story, it's also a game that offers choice in gameplay. You can proceed stealthily, alerting almost no one to your presence, or you can act as a swashbuckling ninja, leaping into battle before zipping out. EDGE: Dishonored. From story-altering decisions to actual gameplay choices, this one's pretty clear: Dishonored's got far more options on offer. BioShock Infinite: When it comes time to throw down, BioShock Infinite becomes an all-out shooter, with enemies rushing at you and forcing you to shoot back until every last one is dead. It's not nuanced, but it can be enjoyable in a frantic way. Dishonored: Dishonored can be an action game, with some truly incredible action. It can also be an almost peaceful game, all sneaking through the corridors and hitting guards with sleeping darts. Or, if you play like most people do, it can be somewhere in between. EDGE: Dishonored. This one's a matter of personal preference; I vastly prefer the smarts and flexibility of Dishonored's combat to Infinite's shouty, chaotic mess. That said, I could imagine how players who just want a simple challenge might prefer Infinite's straightforwardness to Dishonored's more demanding "get out what you put into it" depth. Plus, it's sort of about whether you prefer guns or swords. I'm a sword man, myself. BioShock Infinite: Zachary Hale Comstock is a real piece of work. Something about his voice, Kiff VandenHeuvel's performance lending a questioning, godly touch to his speaking… it just screams duplicity and bullshitty corruption. His false holiness is disgusting, his moralizing racism revolting, and so we spend most of the game wanting to take him down. Which, of course, after the Big Mind-Blowing Twist, means we have to let Booker die, too. Comstock is woven into Columbia in an inextricable way, and his identity defines as much of BioShock Infinite as Elizabeth's. Dishonored: Dishonored has a number of bad guys, and while they're each vile in their own right, none of them are all that memorable. The Lord Regent is the probably the most official big bad, though just about every other character in the game becomes a bad guy in one way or another. EDGE: BioShock. This one's about quality vs. quantity. Although Dishonored's rogue's gallery is more roguish and varied than BioShock's, BioShock's antagonist defines so much of the world and story that he takes the prize. Comstock may not quite be Andrew Ryan, but he's certainly a worthy, memorable foe. BioShock Infinite: As it turns out—surprise!—Booker actually is Comstock, just another version of him that didn't accept baptism after the massacre at Wounded Knee. Elizabeth is his daughter, and in order to right the wrongs perpetuated by his alternate self, Booker allows Elizabeth (in all her multiple-universe forms) to drown him in the baptismal waters and kill him once and for all. Meanwhile, Elizabeth reveals that thanks to the multiverse, there are an infinite number lighthouses, cities, and men—including the first game's underwater city of Rapture, to which the game makes a brief visit. Dishonored: Surprising absolutely no one, it turns out that the politically calculating killers who have hired Corvo were merely planning on using him to kill the Lord Regent and seize power in Dunwall before turning on Corvo and having him killed. It was such a predictable twist that it would actually have been more surprising if it hadn't happened at all. EDGE: BioShock. Infinite wins this one in a walk. Say what you will about the inevitability of the twist and the various problems it runs into with its own twisted meta-logic, BioShock Infinite's twist and ending were executed with aplomb, and Irrational answered enough questions that what mysteries remained were simply fun to explore after the fact. Dishonored's biggest storytelling flaw was its muddled third act; by comparison, BioShock's considered storytelling leaves it in the dust. So there you have it: Two games, two sets of design philosophies, two cursed cities, two violent antiheroes. But what's the verdict? Well, if you've been counting, that's 6 for BioShock, 6 for Dishonored, and 3 toss-ups. So... a tie? That seems like a letdown. Hmm. If I had to reduce this to a single comparison, I'd say that BioShock had better characters and a richer story while Dishonored was more fun and rewarding to play. But of course, both games are interesting, both have their merits and flaws, and both are worth playing. Which game do you prefer? Would Infinite have been better if they'd added more of those weird stealth sections? Would Dishonored have benefited from a skyline? Share your own comparisons in the comments.